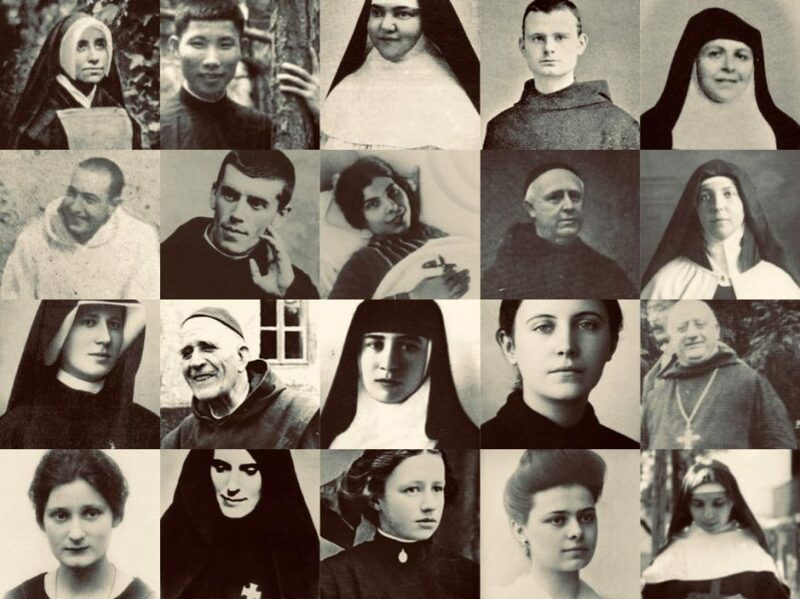 The reward in Heaven for patiently accepting even the slightest suffering is so great that, according to many Saints, if we knew its true value, we would willingly embrace all sufferings, and even go so far as to seek more! Why does God permit tribulations? For our salvation! The more we love God, the more blessings we receive, both here and hereafter; every occasion for growing in love and humility, therefore, should be seen as a great- nay, an INFINITE- blessing! God desires not only that we be saved, but that we become Saints! Why does God desire that we become Saints? I need not warn you of the dangers of selfishness and lukewarmness. The greater we grow in humility, the more we will see our own unworthiness, which, far from discouraging us, will fill us with love for and confidence in Him “… Who came from Heaven to seek you at the very time you were flying from Him.” (St. Thomas of Villanova). However cold, ungrateful or sinful we might have been in the past, let us forget all that; instead, may we follow- with the help of Our Lady- the first movement of grace in our souls that calls us to love the God Who created us out of and for infinite love! That is no pious exaggeration! If only the world knew such love! A Cause For Hope: God’s Unchanging Goodness! “For I am the Lord, and I change not.” (Mal. 3:6) God is infinite. In Him there are no parts: His essence is undivided, eternal, self-giving love. God had no need in creating us; rather, we were created to share His love, His joy, and His goodness. Our Lord revealed to a chosen soul that He desires us to be less anxious about avoiding Hell, and more intent on occupying the place in Heaven that He has prepared for us (cf. ‘Words of Love’ by Bartholomew Gottemoller). Just as the sunflower grows towards the sun when it receives its light, so too do souls draw closer to God as they receive the rays of His love. Remember: it only takes one spark to light a forest. What does this mean? It means that however cold we are, or however sinful, when God offers us His grace, He offers us grace without limit. Our love will continue to grow if we humbly (and with much gratitude!) follow that first inspiration. Many great sinners have followed this inspiration and become great saints. To contemplate God’s unchanging goodness is most consoling. We must not be guided by feelings in the spiritual life; our feelings change as the tides. Instead, be guided by grace, which has its source in the unchanging beauty and love of God, and which leads to that same fountain of goodness! “God is immutable, i.e., He ever remains the same. God never changes; He never becomes better or worse; He never breaks His word. Creation made no change in God; from all eternity He had decreed the creation of the universe. God changes His works, but not His eternal decrees. By the Incarnation humanity was changed, but the Godhead underwent no change, just as the sun is in no way changed when it hides itself behind a cloud. Our thoughts are not changed when they clothe themselves in words; so the divinity was not changed when it clothed itself in the nature of man. God does not change when He punishes the sinner. When the heart of man is in friendship with God, God shows Himself to him as a God of infinite love and mercy; when the heart is estranged from Him, the sinner sees in the unchangeable God an angry and avenging judge. When the eye is sound, the light is pleasant to it; but if it is diseased, light causes it pain: it is not the light that is changed, but the eye that looks upon it [this analogy was used by God Himself to St. Catherine of Siena]. When an angry man looks in the glass he sees a different reflection from that which he saw when he was cheerful and in good-humour; it is not the glass that has changed, but the man. When the sun shines through colored glass, its rays take the color of the glass; the sun does not change, but the light is changed by the medium through which it passes. So when God rewards, it is not God Who changes, but man, who performs different and better actions, thereby meriting the grace of God. When in Scripture we read that God repented of having made man, that God is angry with the wicked, the phrases used are accommodated to our imperfect comprehension. “Sufferings then are no real evil, but are benefits from the hand of God. They are the means of bringing us both to temporal and eternal happiness. God, Who loves us tenderly, has no other object in sending us sufferings but to make us happy. What we count as an evil is the bitterness of the medicine that is necessary for the health of our soul. There is really no evil in the world except sin. Sufferings can never really make us unhappy; men can be happy in spite of all kinds of sufferings. We see this in Job, in Tobias, in Our Lady. St. Paul says, ” I am filled with comfort ; I exceedingly abound with joy in all our tribulation” (2 Cor. vii. 4). The following anecdotes, taken from ‘The Glories of Mary’ by St. Alphonsus, should encourage readers to trust in the intercession of their mother, Mary. + It is narrated by Father Bevms, of a very sinful person named Helen, that having gone to church, she accidentally heard a sermon on the rosary. As she went out she bought one but carried it hidden, so that it should not be seen. Afterwards, she began to recite it; and although she recited it without devotion, the most holy Virgin infused into her heart such consolation and sweetness in it, that she could not cease repeating it. And by this she was inspired with such a horror of her evil life, that she could find no peace, and was forced, as it were, to go to confession. She confessed with so much contrition, that the confessor was amazed. Having finished her confession, she went immediately before an altar of the blessed Virgin, to thank her advocate; she recited her rosary, and the divine mother spoke to her from her image, and said; “Helen, you have too long offended God and me; hence forth change your life, and I will bestow upon you many of my favors.” The poor sinner in confusion, answered: “Ah, most holy Virgin, it is true that hitherto I have been very sinful, but thou, who art all-powerful, assist me; I give myself to thee, and will pass the remainder of my life in doing penance for my sins.” Assisted by Mary, Helen bestowed all her goods upon the poor, and commenced a rigorous penance. She was tormented by dreadful temptations, but she continued to recommend herself to the mother of God; and always, with her aid, came off victorious. She was favored also with many supernatural graces, as visions, revelations, and prophecies. At last, before her death, of which she had been warned a few days previously by Mary, the Virgin herself came with her Son to visit her; and in death, the soul of this sinner was seen, in the form of a beautiful dove, ascending to heaven. + Father Charles Bovius relates that in Doinana, in France, lived a married man who had held a criminal connection with another woman. Now the wife being unable to endure this, continually besought God to punish the guilty parties; and one day in particular went to an altar of the blessed Virgin, which was in a certain church to implore vengeance upon the woman who had alienated her husband from her; and this very woman went also every day to the same altar, to repeat a “Hail Mary.” One night the divine mother appeared in a dream to the wife, who, on seeing her, began her accustomed petition: “Justice, mother of God, justice.” But the blessed Lady answered: “Justice! do you seek justice from me? Go and find others, to execute justice for you. It belongs not to me to do it for you. Be it known to you,” she added, “that this very sinner offers every day a devotion in my honor, and that I cannot allow any sinner who does this, to suffer and be punished for his sins.” The next day the wife went to hear mass in the above-named church of our Lady, and on coming out met her husband’s friend; at the sight of her she began to reproach her and call her a sorceress, who had even enchanted with her sorceries the blessed Virgin. “Be silent,” cried the people: “what are you saying?” “Be silent!” she answered: “what I say is only too true; this night the Virgin appeared to me; and when I implored justice of her, she answered me that she could not grant it on account of a salutation which this wicked woman repeats daily in her honor.” They asked the woman what salutation she repeated to the mother of God, She answered that it was the “Hail Mary;” and then on hearing that the blessed Virgin had dealt with her so mercifully in return for that trivial act of devotion, she cast herself on the ground before the sacred image, and there, in the presence of all the people, asked pardon for her scandalous life, and made a vow of perpetual continence. She afterwards put on a religious habit, built for herself a little cell near the church, where she retired, and persevered in continual penance until the day of her death. + Father Eusebius Nierembergh relates that there lived in the city of Aragona a girl, named Alexandra who, being noble and very beautiful, was greatly loved by two young men. Through jealousy, they one day fought and killed each other. Their enraged relatives, in return, killed the poor young girl, as the cause of so much trouble, cut off her head, and threw her into a well. A few days after, St. Dominic was passing through that place, and, inspired by the Lord, approached the well, and said: “Alexandra, come forth,” and immediately the head of the deceased came forth, placed itself on the edge of the well, and prayed St. Dominic to hear its confession. The saint heard its confession, and also gave it Communion, in presence of a great concourse of persons who had assembled to witness the miracle. Then, St. Dominic ordered her to speak and tell why she had received that grace. Alexandra answered, that when she was beheaded, she was in a state of mortal sin, but that the most holy Mary, on account of the rosary, which she was in the habit of reciting, had preserved her in life. Two days the head retained its life upon the edge of the well, in the presence of all, and then the soul went to purgatory. But fifteen days after, the soul of Alexandra appeared to St. Dominic, beautiful and radiant as a star, and told him, that one of the principal sources of relief to the souls in purgatory is the rosary which is recited for them; and that, as soon as they arrive in paradise, they pray for those who apply to them these powerful prayers. Having said this, St. Dominic saw that happy soul ascending in triumph to the kingdom of the blessed. 23. Father Crasset relates, that a certain military officer told him, that after a battle he found a soldier on the battle-ground who held in his hand a Rosary and the scapular of Mary, and asked for a confessor. His forehead had been pierced by a musket-ball, which had passed through the head and came out behind, so that the brain was visible and protruded through each opening, and he could not live without a miracle. He however raided himself, made his confession to the chaplain with great compunction, and after receiving absolution, expired. 24. The same author adds, that this very captain told him of being present when a trumpeter of his company received a pistol-shot from someone near, and when be examined his breast where he said that he had been hit, he found that the ball had been stopped by the scapular of the Virgin, which the man wore, and that it had not even touched the flesh. He took it and exhibited it to the whole company. The blessed religious continued to lead a holy life till he died a happy death in the arms of Mary. May we, too, die in the arms of our tender mother, Mary. Humility is essential for conquering scrupulosity, as is the virtue of magnanimity. We must pray for these precious graces. Apart from these virtues, however, there is another attainable remedy for scrupulosity, namely, a good understanding of basic theological principles. Before sharing these explanations, please ask God (frequently) for the grace to be humble, confident and loving. The intercession of St. Gertrude- who manifested a boundless confidence in God- is very powerful in this regard. Those who desire to love God should pay absolutely no attention to such temptations. Imagine that a child (Thomas) loves his mother. Would he worry about accidentally saying something to offend her? Of course not. Similarly, if he came to know that his mother could read his thoughts, would he then be justified in worrying? Of course not. Nothing, in essence, has changed. Thomas’ mother, having a mind of her own, would understand if Thomas had the occasional bad thought. She would be more upset if, instead of loving her, he spent his time worrying that he was not loving her! Love, you see, is what God asks of us. Nothing else. Try this and you will find that God rewards your confidence. With what, you ask? With more confidence! … And peace! And a greater joy! Confidence in God is like a snowball; the more we practice it, the more it grows. To merely look at a woman is not lustful in and of itself. A child can recognise the beauty of his mother without giving in to unnatural sexual urges; a Saint can appreciate the great beauty of the Blessed Virgin, or the incomparable beauty of Jesus; a man is obviously attracted to his wife. It is not inherently long to look at God’s beautiful creation. Looking at, or thinking about another, becomes lustful (and therefore sinful) when our intention is to arouse ourselves, or when there is a near occasion of sexual pleasure/arousal. The Scriptures recommend that we practice a reasonable custody of the eyes. We should not “gaze” upon another when it gives rise to sexual pleasure or when this is likely to happen e.g. when “scanning” the body of another. Some have applied the counsels of the Scriptures very rigorously. Certain Saints, for example, scarcely lifted their eyes from the ground. Their purity is surely commendable, but we are not obliged to do the same. Simple souls should not read certain writings of the Saints, as this may lead them to form false impressions, or to discouragement. It is recounted of one Saint that he would shed tears when beholding the beauty of a woman. Of course, he appreciated the beauty of God’s creation with reference to God. “A) Gluttony is a grievous fault: a) when it goes to such lengths that for a notable space of time it incapacitates us for the fulfilment of our duties of state or for the compliance with divine or ecclesiastical laws, for example, when it injures our health, when it is the cause of useless expenditures which endanger the interests of our home, when it makes us violate the laws of fast or abstinence. b) It is also a grave fault when it is the cause of other grievous faults. God is all-good, all-knowing, and the source of all good. God knows our hearts; He knows our every good desire, because He is truly the source of every good desire. When faced with doubt and uncertainty, we should reason thus: Dear Lord, you have placed in my heart the desire to love you. I do not want to hurt you by committing intentional sin- much less intentional mortal sin. This gives me confidence that I could not fall into such sin without being fairly certain of it, because you alone have given me this noble desire! Thank you, dear God. Please help me to trust more in you, and to cast aside all useless doubts and worries. Sorrowful and Immaculate Heart of Mary, pray for us.